Flowers are not the type of thing that fossilize very easily, so no big surprise that there are so few to help figure out the "sudden" appearance of flowering plants in the fossil record. So here is a reconstruction of a pre-Cretaceous (Jurassic) fossil flower. TPP isn't particular impressed as there are some items that just don't quite make sense. But we shall see what the important people have to say about this flower. The biggest problem is that crazy branched thing that is being labelled the stigma; it's like nothing else any where. And then there is one little item (little knobby thing at about 11 o'clock) that hasn't been identified at all. For those of you who do not keep up with the plant fossil record, there are no well authenticated pre-Cretaceous flowering plant fossils at all. This fossil would be a first, and it's supposedly a flower. Well, see what you think. It's name is Nanjinanthus, which tells us where in China this fossil was found. Taking the time and effort to visit the Morton Arboretum to see their light show is well worth the expense and the time. 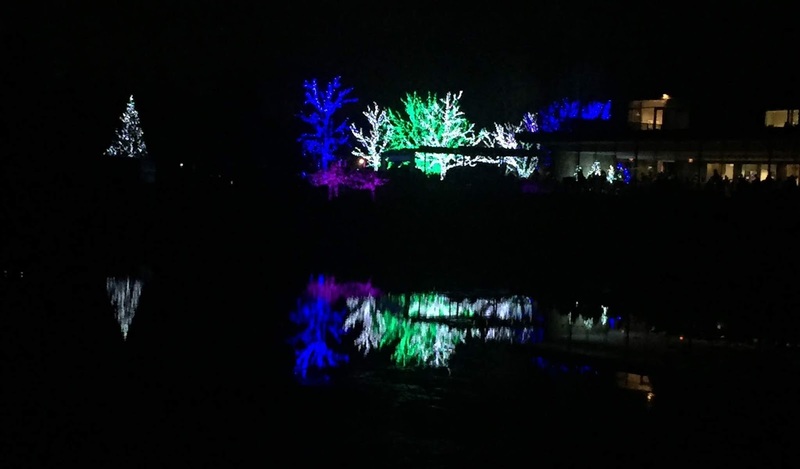 Last Friday was our first visit to the Arboretum for holiday lights. It was very impressive, very attractive, very inventive. This image is just a small sample of the entire show. Several displays were set to music. 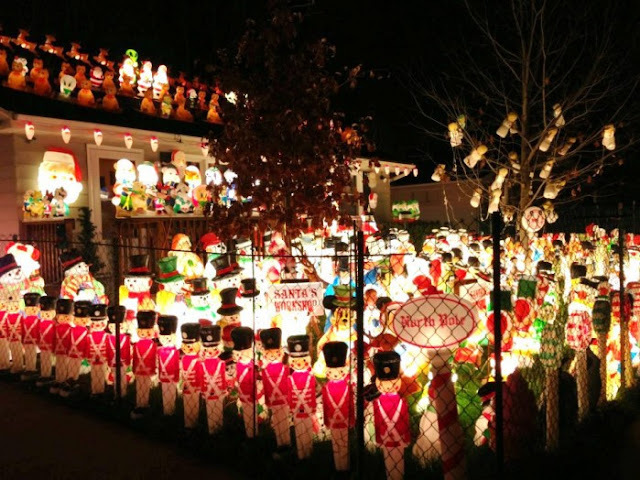 There aren't any snowmen or other annoying items (A local guy has filled his yard and a neighbor's with plastic figurines much to the amusement of the orbiting space station, which must be able to see this easily.) This display is free, and even then not a bargain. Although not ideal conditions, the weather finally stayed warm enough and dry enough for the tons of leaves in our yard to get rounded up. Unfortunately, while many got deposited in an area destined to become a woodland garden, the guys with backpack blowers added a lot of leaves to some of our gardens where they will remain until March. This means that the net hung over the lily pond could be removed, but it wasn't easy. In places the net was not just filled with soggy leaves, but frozen into the shell ice. This added greatly to the weight and therefore the difficulty of removing the net. It was all the two of us could do to pull it out! Such a bother but probably kept 90% of the leaves out of the pond. In some places the Scilla bulbs that turn our yard blue have sprouted waiting for the first hints of spring. The local fall weather was pretty mild and so our tropical houseplants stayed outside a bit later into the season than in the past. And then November turns cold and includes several snow events (none really serious). As if it isn't confusing enough a warm front moved into our region on Friday and the temps got very mild, while we got treated to thunderstorms and tornadoes. Although tropical plants are often day neutral, the longer cool nights seem quite capable of inducing flowering in quite a few of our tropical house plants. Both the so-called Christmas cactus and the Easter cactus promptly produced a huge flush of buds and began flowering. The induction period in most houses must take a bit longer such that the cacti more or less flower near their namesake holidays. Now of course commercially glass houses can be manipulated to bring plants into flower at the appropriate season for sales. But with house plants you take more or less what you get. So, yes, a Christmas cactus flowering some three weeks before Christmas. Fridays have turned out to be pretty busy days in our semi-retired/retired lives and TPP if finding it tough to find time for blogging. So please indulge the irregularities.